In Mangunan Pine Forest what tourism is there? What is the difference between Mangunan Pine Forest and other regional pine forests? Things you should prepared when visiting Mangunan Pine Forest. Who would have thought Mangunan Pine Forest in Yogyakarta, is going to be very hits and viral in the universe of social media now? If you have ever goes to Mangunan Villages, its usually because of related to chicken farms businesses or those who often play Downhill. People used to pass Patuk – Dlingo roads, were already scared first. The way to go there, were winds up and down. The roads also very quiet, surrounding by the forest. 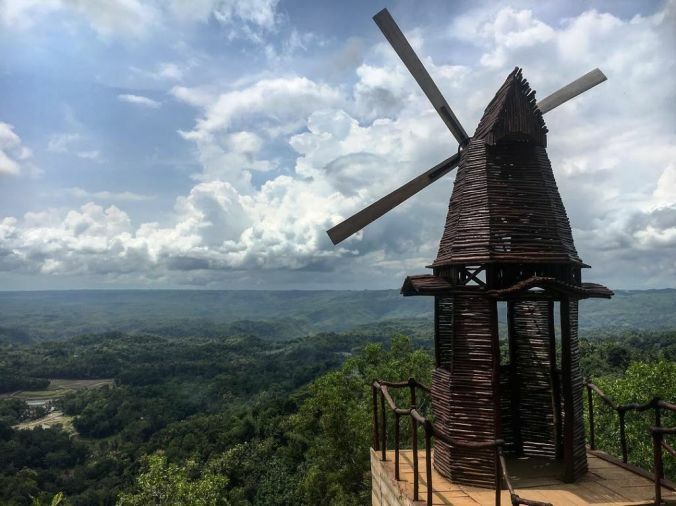 Mangunan Village, was actually just a small part of the Topography of Karst hills that stretches from Bantul to Pacitan (East Java). 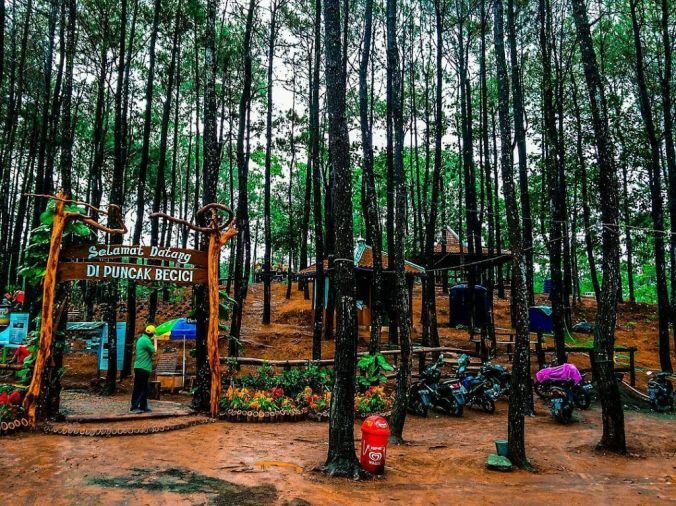 Located at Bantul district, In a fairly high location where pine trees can live. The Village is actually ordinary. There’s nothing special such as Ten’s meters high Waterfall, or a Cave with an underground river. 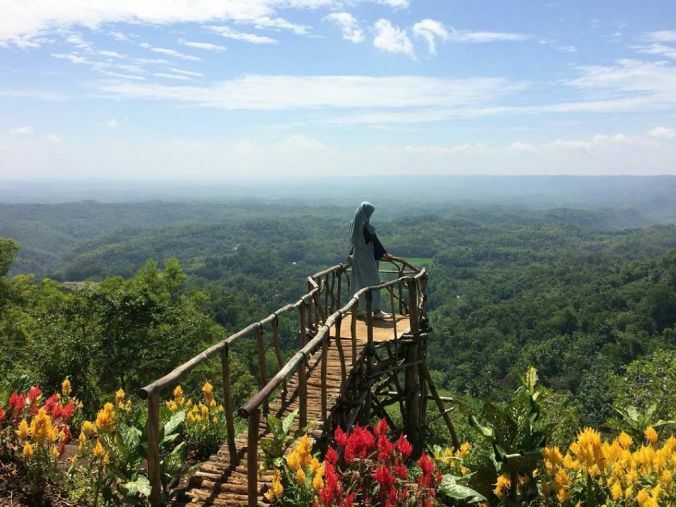 The village is just not like Mungkid Magelang, which has a Borobudur temple, inherited from an ancestor. The Village not like Uluwatu, which have a beautiful Sea. Mangunan village is just only a plateau, that divided by The Oya Rivers with lots of trees surroundings. People of the village had to do something, to make tourists visits their area. Now Mangunan Village is almost like Mount Merapi. Everyday people visits there to traveling, Enjoying a new types of tourism. Highlands and selfie tourism were the main type of new tourism attraction. Sometimes, The object of attraction must be update. Changing or updating with a new one, to make the people get boring when visit there for the second time. Even some people are willing to queue for hours just for take a selfies. There are several tourist attractions you can visit. Almost of them are Pine forest’s ambience. You can start with Pinus Pengger Forest, or Watu Goyang, or Songgo Langit. 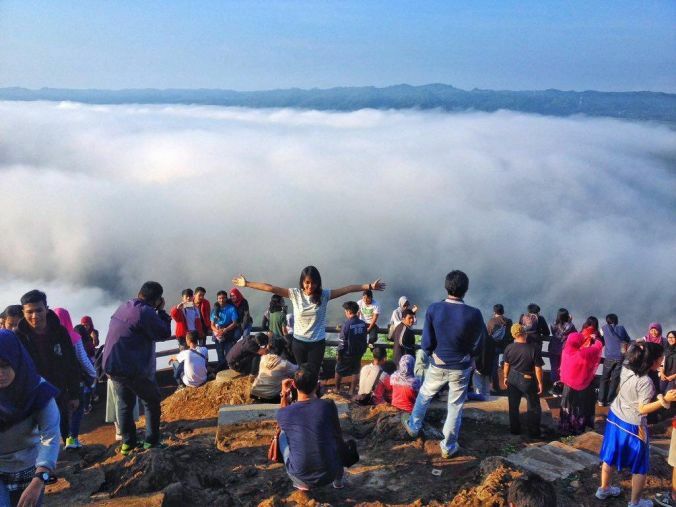 Then you should visit Panguk Kediwung Hill, or Mojo Gumelem Hill. Don’t forget to see Mangunan Fruit Farm, or Becici Peak or Pine Mangunan Forest itself. The type tourism that offered there is a landscape of hills which is almost the same as the scenery with other highland areas. But. The difference was the Human creativity. That can make something looks ordinary, becomes something that Hits, Spectacular, and certainly Viral (a term that becomes a reference for a place that must be visited). The view of pine forests everywhere is the same. There are pine trees everywhere, highlands, or viewing post. The creativity makes it different. Some place in Mangunan Areas give a Hammock with good placement down the forest, its a cool background for selfies. Hobbit houses were built with the right ambience, that’s a spectacular background. The viewing post is no longer shaped like a security post, but can be in the form of a helicopter, ship, sunflower, etc. That’s how local people using a creative ideas to make a changes. From backwards and quiet areas, Now Mangunan Villages turns into a very crowded tourist destinations. Imagining how hard the projects was build properly. Of course, The collective work by Art workers and Stake Holders there is not as easy as writing this article. The spot accurate selections, The appropriate viral ideas and Local Communities and government supports. 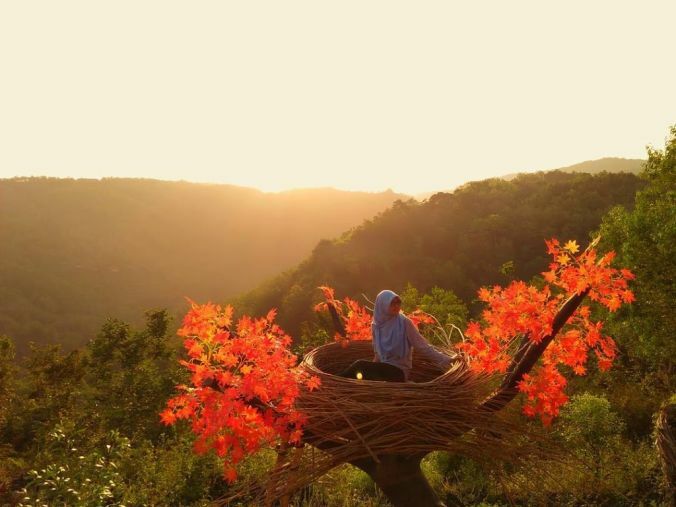 The three great combination to make Mangunan for being a vacation area that is very worthy of tourists visiting. The Mangunan Pine Forest located on a plateau. You should bring a jacket or jumpsuit to keep your body warms. Especially when you want to meet the sunrise, sunset, or the arrives of fogs (although in reality, you will dry up when you go hiking up to a high place). Prepare yourself not to be able to pee easily. There is no mini market (for a free toilet) lies on the edge of the highway (although there must also be a small toilet over there). If you’re using a private vehicle, don’t forget to check and re-check the condition of your vehicle. The narrow, up and down winding roads will force the vehicle to work harder. Especially the clutch and brakes. Don’t let those situation break your car or hitting another vehicle. During the peak season, those small path would become a jammed road, due to the surge of tourist visits. Don’t think its easy to take pictures at the tourist attractions. Those actions requires enough efforts to queue precisely. But, You’re going to lose if you get there but don’t get the moments of photography, instead you go home. In 2017, Former US President Barrack Obama, visit The Becici Peak in Mangunan areas. When did you visit there?